Suitable for Derbi EBE / EBS engines. Used by Derbi and Gilera up to 2005.Please notice that there are two kind of cylinder kit for Derbi Senda, from Year 2000-2005 and from Year 2005-2016. This Cylinder will fit Derbi Senda 50cc 2000-2005.And it includes the Cylinder block barrel, piston,piston ring,gasket,pin,etc.Diameter of the bore is 40mm,or we can do if you have other requirements. These scooter models is very popular in the Europe,such as France,UK,Sweden,Italy,etc.People can replace the engine parts so that to power the bike to its best performance.We recommend sports exhausts to go with it. An original high-end carburetor is not necessary, but you will definitely increase performance by adding a 17.5mm carburetor. The Main Jet has to be adjusted accordingly. 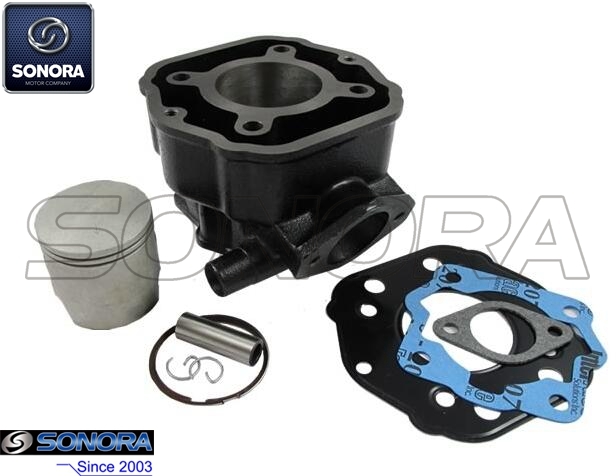 Now Sonora Motors are supplying good quality Derbi Senda parts at a very competitive price,we can supply cylinder,stator,carburetor,crankshaft,etc for Derbi Senda.Besides, Sonora Motors are supplying good quality various brands of scooter and motorcycle parts, such as Crankshaft Crank Shaft, Clutch & Driven Pulley, Variator & Front Drive Pulley, Cylinder Kit, Starter Motor, etc. If there are some dimensions or photos for this Derbi Senda Cylinder you require, please feel free to contact us,we'll answer you in one working days or even sooner. Sonora Motor can supply all kinds of various Chinese and European brands of scooters and motorcycles, expecially good at supplying the cylinder kit , Gasket Kit , CDI Ignition, Voltage Regulator Rectifier, Starter Motor, Magneto Stator Coil,etc. If you have any other needs for scooters and motorcycle parts, please feel free to contact us. Looking for ideal Derbi Senda 2000-2005 Cylinder Kit Manufacturer & supplier ? We have a wide selection at great prices to help you get creative. All the Derbi Senda 50cc Cylinder Kit are quality guaranteed. We are China Origin Factory of Derbi Senda 2000-2005 Cylinder Kit Replacement. If you have any question, please feel free to contact us.